Oriental rugs are not only produced in numerous countries and areas around the world, they often exhibit elements which are expressly representative of where they originate from. Understanding what these various symbols and motifs mean, apart from how beautiful they appear on rugs themselves, should be a component of every Oriental rug lover’s education. Today, we will give a somewhat wide-ranging overview of the various representations found on many Oriental and Persian rugs, hopefully enlightening our readers on the religious and secular designs that often find themselves woven into these spectacular articles. Rug makers throughout history have received inspiration from the architecture, shapes and structure of buildings close to their heart or home. Even tiles in mosques, palaces and other sites have played a part in the formation of stunning Oriental rugs in the past few decades. Interestingly, the weavers’ interpretations of these buildings or structures often take on a life of their own, showing the mark of a true artist in how they are represented on the completed piece. One of the most beautiful motifs in Oriental rugs is the Shah Abbasi, which is the name used to describe a grouping of palmettes typically found along the borders of a carpet or in an all-over design. Tabriz rugs are well-known to have this motif as part of their structure, representing a great deal of time and talent on the part of the weaver. A Rosette will usually be part of a medallion, radiating out from the center of a rug in a circular array that implies the opening of rose petals. The Rosette design will sometimes be displayed in a carpet’s borders, yet it is far more popular for it to be located in the rug’s center, building outward in either a geometric or naturalistic structure. A distinctive pattern which is present in a number of Oriental rug designs, the Mina-Khani is comprised of daisies being repetitively used and interlaced by curved or circular lines which appear diamond-shaped. More often than not, the design is part of an all-over pattern, and will often cover the entire area within a rug’s borders. Herati motifs are common in many Persian rugs, typically consisting of a central flower which is surrounded by curved leaves in a diamond shape around the flower. There are a number of ways the Herati can be represented on a carpet, either in geometric or curvilinear designs. 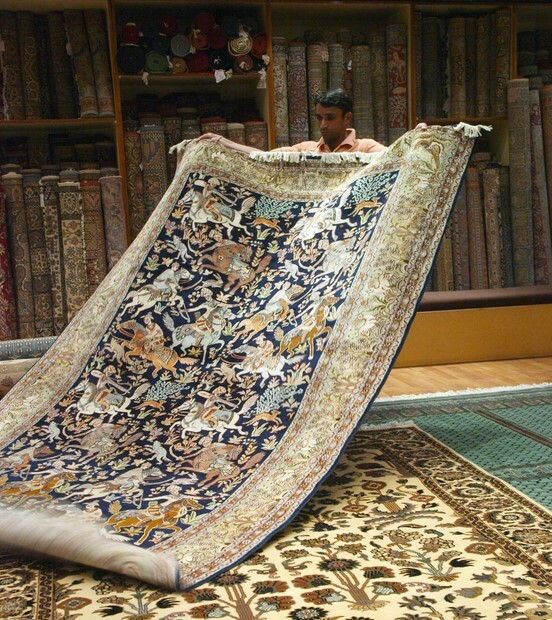 The Boteh is a very common design in Persian carpets and is often referred to as a paisley motif in Western culture. The word itself is Farsi, being used to describe an immature flower or palm leaf. They are frequently part of an over-all design on a rug, decorating the entire field, but may be used in isolation in more complex pieces. Though many motifs and symbols in Oriental rugs remain, these are some of the most common found in carpets around the world. Now that you’ve learned a little more about the rugs themselves, make sure to visit our gallery to test your knowledge on our enormous selection of rugs and textiles. Also, if you already own a rug which has seen better days, allow us to revive your piece through our comprehensive cleaning services or by having one of our Oriental rug specialists make any necessary repairs.